What is the Difference between Phonetic Fonts and Phonetic Keyboard? ગુજરાતીમાં આ વેબ પેજ વાંચવા માટે અહિયાં ક્લિક કરો. There's a big difference between phonetic fonts and a phonetic keyboard. If you understand the difference, then you'll be able to decide if you want to type with Unicode fonts or non-Unicode fonts and when to use them. Phonetic fonts are non-Unicode fonts, which are relatively easier to develop. Hence, you may be able to find variously styled fonts. You cannot type true Gujarati with phonetic fonts because they are non-Unicode fonts. What you type with non-Unicode fonts is actually English disguised as Gujarati. Unicode fonts run scripts in the background as you type so that appropriate substitutions are made. Hence, typing conjuncts (half-letters) is easy and simple. You can type with Unicode fonts anywhere in the OS, such as Run box, Save box, Wordpad, Notepad, etc. If you don't like the default keyboard layouts included with Windows or Linux, you can switch it to another layout. You can use my Gujarati Phonetic keyboard, which has the keys mapped phonetically. Phonetic fonts are fonts that have the Gujarati characters mapped phonetically on an English keyboard. Hence, you might type 'k' to write 'ક' and 'g' to write 'ગ'. Such fonts include Harikrishna, Ghanshyam, Yogi, Amrut, Sugam, etc. Phonetic fonts are non-Unicode fonts. You may think typing with non-Unicode fonts that are mapped phonetically might be a great idea; however, what you type is really not Gujarati but English in disguise. Only the characters look like Gujarati. To type discernible Gujarati is impossible with non-Unicode fonts. Images below show how the text typed with non-Unicode fonts is still English. 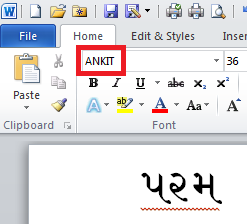 In the image above, 'Ankit' font has been used to type 'પરમ'. Ankit font is a non-Unicode font that has a phonetic map; hence, you can't type real Gujarati with it. 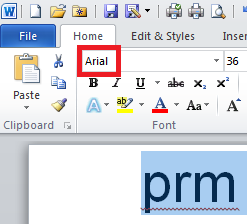 If you select the text and change the font to Arial, you will see that you really typed 'prm'. So, it only looked like 'પરમ' but was really 'prm'. 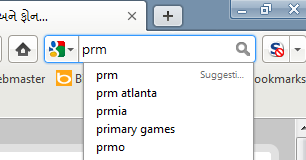 If you copy and paste this in your web browser's search box, you will have pasted 'prm' because it is actually Gujarati. If you create a webpage in non-Unicode fonts, the HTML code will look gibberish because text editors cannot display non-Unicode Gujarati text, but they can display Unicode Gujarati. This makes it harder to edit the HTML code. But if your visitors have that non-Unicode font installed, they will be able to read the text. However, they MUST have that font installed. Some fonts are proprietary so you may not be able to make them available for download. However, the Shruti font is pre-installed in Windows XP, Vista, and 7. So anything typed with Unicode fonts should be readable by all your visitors. Phonetic fonts are non-Unicode fonts. You cannot type discernible Gujarati with non-Unicode fonts. What you type with non-Unicode fonts is actually meaningless English. None of the OSes (Windows, Linux, Mac OSX) recognize non-Unicode input. Not all non-Unicode fonts are phonetic fonts. Some font families such as the Indica set; which include Nakul, Sahadev; are non-Unicode fonts that do not have a phonetic mapping. They share their own unique keyboard mapping. Non-Unicode fonts do have benefits that are mentioned here. First, non-Unicode fonts are easier to create than Unicode fonts. Unicode fonts are very complicated to create because the developer has to create subsitution tables that occur when certain characters are typed. This is basically Unicode scripting that is required for Gujarati substitutions. There are many, creative non-Unicode fonts already available compared to only a few Unicode fonts. The very reason is Unicode fonts are time-consuming to develop. Some programs that don't support Unicode input, such as Adobe Photoshop, will work with non-Unicode fonts. Moreover, once the image is created with Photoshop, it doesn't matter if the text is Unicode or not since it's merely an image. Unicode fonts are not inherently phonetic, but it is the keyboard that you can create for Unicode fonts that can be phonetic, such as my Gujarati Phonetic keyboard. That's why it's a phonetic keyboard and not a phonetic font. The benefit of this is that any type of keyboard, phonetic or otherwise, can be used with any Unicode font and obtain the same result. So, you can use the default Gujarati keyboard included with Microsoft Windows and type 'પ' by typing 'h' or you can use my Gujarati Phonetic keyboard to type 'પ' by typing 'p'. The result will be the real 'પ' in Gujarati regardless of the keyboard. By 'real પ', I mean that the Unicode character code for 'પ' will be the same for both keyboards, which is 2730. Hence, it doesn't matter what layout you use to type with Unicode fonts, the character codes will be the same. These character codes are given on this web page: Gujarati Unicode Entities and Character Codes Reference. 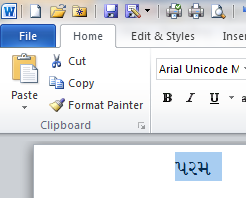 In the above example, we typed 'પરમ' using non-Unicode fonts. In the below images, you will see that typing 'પરમ' with Unicode fonts results in real Gujarati. If you type 'પરમ' with Shruti Unicode font, then select it and change the font to Arial, the font will change back to Shruti. Why? 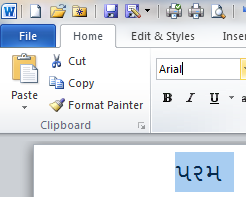 Because Arial does not have any Gujarati characters. It is an English font. However, if you select the text and change the font to Arial Unicode MS, the font will change because Arial Unicode MS contains the characters for Gujarati. You don't have to know the Unicode character codes for Gujarati characters in order to type Gujarati. You can create HTML Web pages by using UTF-8 encoded documents. However, if you want to create ANSI encoded Web pages, you need to know the Unicode character codes. I have explained how this can be done here: Create Gujarati Web Pages with ANSI Encoding. You can convert non-Unicode text to Unicode text with programs. Since there are several types of non-Unicode fonts and they may use different keyboard maps, you may not be able to find a program that converts the text you typed with a particular non-Unicode font. However, certain well-known non-Unicode fonts can be converted, such as Harikrishna. I have created a Harikrishna to Unicode converter that is found here: Harikrishna to Unicode Conversion. It works with all fonts that share the layout of Harikrishna, such as Sugam, Nilkanth, Ghanshyam, etc. If you want an offline conversion tool, I have created a macro-based template for Microsoft Office Word that can convert Harikrishna-type fonts to Unicode. 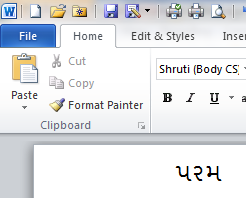 You can download it here: Gujarati and Unicode Tabs for Microsoft Office Word. What is the Shruti Font? શ્રુતિ ફોન્ટ શું છે અને તે કેવી રીતે વાપરવો ? વીન્ડોઝમાં ગુજરાતી/હિન્દી ભાશા આધાર સ્થાપીત કેવી રીતે કરવો ? What are Phonetic Fonts and Phonetic Keyboard? ફોનેટીક ફોન્ટ્સ અને ફોનેટીક કીબોર્ડ શું છે ?